ADVAN Institute of Foreign Languages recruits full-time and part-time English teachers at Numazu, Gotemba, Fuji Schools, and local companies, all located in Shizuoka Prefecture, Japan. We also recruit ALTs to work at public and private schools in Eastern Shizuoka. We are looking for friendly, self-motivated, and responsible teachers to join our institute. Furnished accommodation available: ¥80,000 per month. All utilities and an internet connection included. eastern Shizuoka prefecture with commanding view of Mr. Fuji, the World Heritage Site, over Suruga Bay. Numazu City is famous for deep-sea fishery and there are many restaurants you can enjoy the deep-sea fish cuisine near the Numazu port. 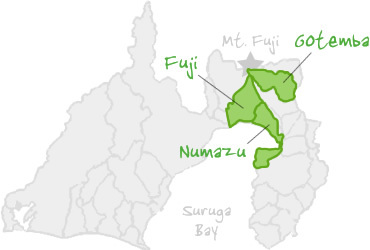 Numazu has the longest coastline in Shizuoka. Senbonhama (thousand pine tree beach) is considered as one of the best places to view Osezaki, Nihondaira, and Japan Alps. Gotemba City is located near the foot of Mt. Fuji, making it a base for transportation to Fuji five lakes (Fuji Goko), Hakone, and Mt. Fuji itself. During the official Mt. Fuji climbing season, there are direct buses available from Gotemba station to the 5th station of Mt. Fuji. Gotemba City is also known as a summer resort area because it is cool in summer, benefitting from Mt. Fuji. Many villas and company resort houses are located in the area and there are more than ten golf courses throughout the city. Fuji City is a mixture of industrial areas and a vast expanse of the nature at the foot of Mt. Fuji. As Shinkansen (bullet train) stops at Shin-Fuji Station in Fuji City, you can travel to/from Tokyo for just a little more than one hour. Mt. Fuji Children’s world in Fuji City is a large play area with the grand Mt. Fuji in the background. It consists of five small “countries” in different themes. Both children and adults can relax and play freely in nature. Copyright © 2015 ADVAN. All Rights Reserved.